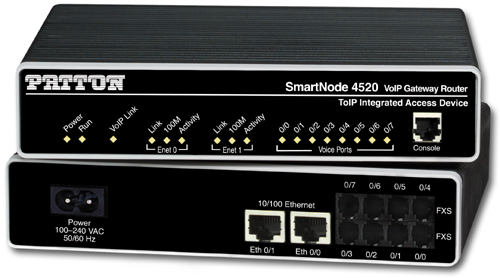 The SmartNode 4520 Series VoIP Gateway Routers combine IP routing, VPN/Security, and Quality of Service for up to 8 transparent voice and FAX calls over any IP or PSTN network. Leverage low-cost IP services with packet-voice for complete branch office voice and data connectivity. Eight FXS, FXO, or FXS/FXO Connections—Up to 8 FXS ports connect to your standard telephone or PBX. 2 or 4 FXO ports allow local PSTN connections. Programmable call routing switches between local or remote connections. QoS guaranteed Voice and Data—Quality of Service ensures voice traffic gets priority without shutting down your Ethernet LAN. Firewall, NAT, DHCP, PPPoE—Connected to any broadband or access provider, serve the whole network, and secure your data. User configurable IP services ensure every host is connected to the LAN. IPSEC VPN, Encryption, & VLAN—Connect your telephone for IP access and secure your voice with optional IPSEC with DES/3DES or AES for encryption. VLAN tagging/stripping allows advanced networking today. ToIP ClearConnect™ Failover Protection—Link monitoring ensures your call will always go through with automatic PSTN cut-through if the IP link is down or congested. Enhanced circuit-switched call routing allows user programmable and adaptive call handling. H.323v4 and SIP Signaling—Deploy into any multimedia, interactive, or softswtich network with the leading call and session signaling protocols. Toll Quality CODECs & T.38 FAX—Use standard G.711 or G.726 CODECs for toll-quality voice or G.723.1 or G.729ab for low-bandwidth applications. 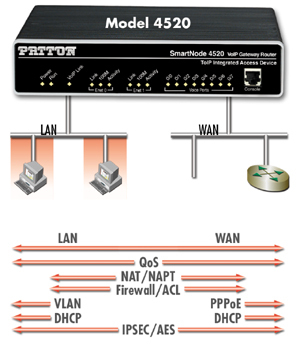 As an Enterprise router the SmartNode offers QoS voice, wire-speed traffic shaping, and complete network access. With dual 10/100 Eternet ports, the SmartNode connects your hosts to your LAN with VLAN tagging, DHCP server/client, and Firewall/ACL services. Use PPPoE and IPSEC VPN with DES, 3DES, and AES encryption and bring your Voice and Data to the WAN through a single and secure network connection. 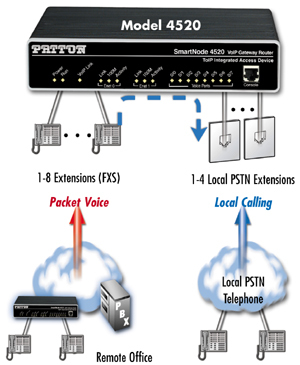 Using Patton's SmartNode Gateway routers with FXS & FXO ports allows seamless access to both remote packet-voice and local PSTN telephony. Using ToIP call switching, distinctive ring, and Caller-ID a single handset can now access the right service at any time. With Patton’s ClearConnect™ fail-over protection your phone call will be completed. Network health monitoring and ToIP switching ensures a clear call even if the IP network is down.